having finally seen FROZEN, i've decided that i like it! i'll have to watch it a few more times at home to know if i love it though. but i can say with some certainty that "Let It Go" song by Idina Menzel (not Demi Lovato cuz i'm not a fan of her voice whatsoever) is fantastic and she sings it with such power that it's hard not to get emotional. must be all that broadway experience. and the sequence - WOW! the whole movie really is probably the most gorgeous thing i've seen to date. i thought Jack Frost's swirly ice stuff was pretty but this is breathtaking. of course, i'm a fan of pretty swirly patterns. anyway, i digress. immensely. SO, about the image above! =P this is a 2-part commission that i finished just like a month ago but was started around November. the holidays plus the whole hospital debacle really put a huge hold on completing this but the client has it now and all is right with the world! =) i posted the Princess Bubblegum half back in November when i finished it. 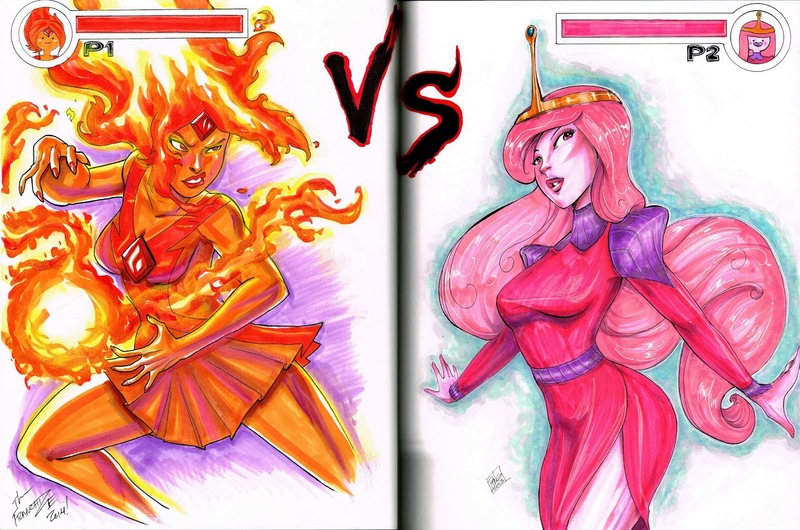 Flame Princess was drawn and colored by theFranchize. wanted to show both halves now. all of this was drawn with copic pens, copic markers, some colored pencils, and some white gel pens.